THEATRE Fest West brings The Bureau of Untold Stories to Trow­bridge Town Hall Arts on Thurs­day 14th February. Brymore Productions has discovered that Wiltshire’s greatest stories could disappear, thanks to the machinations of a notorious criminal. The company specialises in innovative, interactive and improvised children’s theatre and comes to the festival, celebrating its eighth year. Inspectors Dexter Sharpe and Poppy Hasluck will be hunting for The Eraser, an elusive criminal mastermind suspected of stealing the world’s stories. 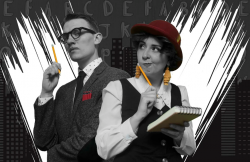 With outrageous accents, unconventional storytelling, live sound effects, and the help of the audience, The Bureau Of Untold Stories will get them back. This imagination-igniting detective drama is a show for the whole family. See it at Trowbridge Town Hall from 7pm.